This comes after the Virginia governor faces his own yearbook-related scandal. The controversy surrounding Virginia Governor Ralph Northam's alleged ties to a racist yearbook photo has been followed by the discovery of a similar image in a University of North Carolina, Chapel Hill yearbook. Colin Campbell, an editor in North Carolina for the Insider State Government News Service, tweeted the yearbook photo, which appeared on a fraternity's page, on Wednesday. It shows two people in Ku Klux Klan garb pretending to hang a man who is wearing blackface and a noose around his neck. Campbell wrote in the tweet that he "randomly flipped through the 1979 UNC-Chapel Hill yearbook today just to kill some time, and found this photo on one of the fraternities' pages." Both UNC and the fraternity in question have released statements condemning the photo. 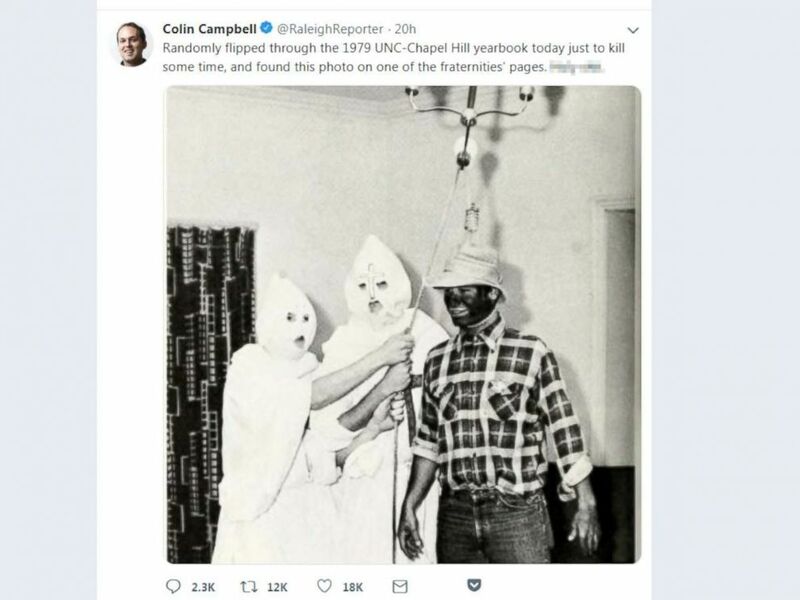 (Colin Campbell/Twitter) Journalist Colin Campbell from North Carolina tweeted this photo he says he found in the 1979 edition of the University of North Carolina at Chapel Hill yearbook. "The photos found in the 1979 student yearbook are abhorrent. We fully and wholly condemn both the photos and the racist behavior they depict. That kind of behavior has no place on our campus now or then," said Joel Curran, the vice chancellor for communications at the university. Campbell said it was the yearbook photo scandal embroiling Governor Northam that prompted him to look at the UNC-Chapel yearbook, he told ABC News. The yearbook that he selected was for the graduation year of North Carolina Gov. Roy Cooper. Campbell said that while "there weren't any photos of him that were objectionable," he saw the racist photo on a nearby page for the Chi Phi fraternity. "We strongly denounce the behavior and sentiments displayed in these images. Bigotry is not welcome in our Fraternity," Chi Phi National wrote on Twitter in response to Campbell's post. The university did not immediately respond to requests for details on whether any action would be taken. 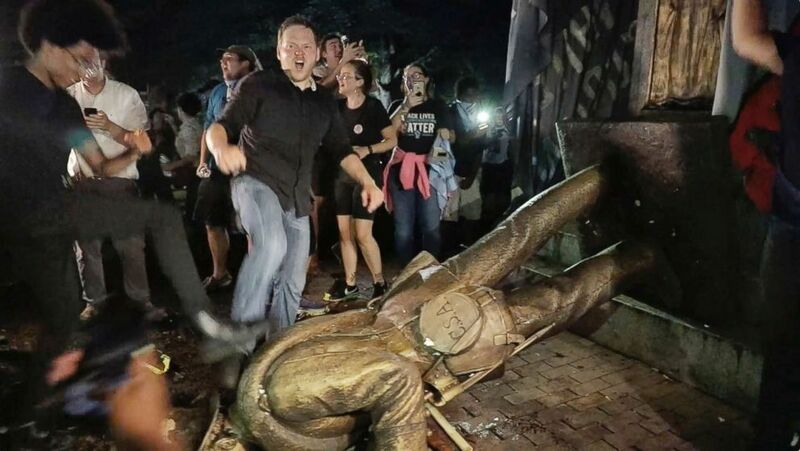 This is not the first race-related issue that UNC-Chapel Hill has had to deal with this year. The school's chancellor announced in January that she would resign at the end of the school year amid an ongoing debate over the removal of a Confederate monument on campus called "Silent Sam," which was toppled as part of a student demonstration in August. The chancellor supported the removal of the statue. (Julia Wall/The News & Observer via AP, FILE) Protesters celebrate after the Confederate statue known as "Silent Sam" was toppled on the campus of the University of North Carolina in Chapel Hill, N.C., Aug. 20, 2018. Campbell said that there's been, "not surprisingly, a large amount of outrage" after he posted the picture to Twitter. He said that no one had identified the individuals involved because their names were not listed directly below the picture. But, in a subsequent tweet posted by Campbell that showed the full spread of the page, there was a photo of the fraternity members with each of their names listed. The scandal over Northam's yearbook photo has prompted a chorus of calls for his resignation, and it comes only a few months after Supreme Court Justice Brett Kavanaugh faced questions over references to drinking and partying in his high school yearbook during his confirmation hearings. "What it has really shown us, this school year in particular, is just how significant a yearbook really is — not only for now but for later," Sarah Nichols, the president of the Journalism Education Association, told ABC News in the wake of the scandal about Northam’s yearbook.